It all began in the Summer of 2011 in a local bookstore with the Founder of The Good Java Company, Jonathan Bates. The name and logo of TGJC suddenly appeared in his mind and he quickly sketched them out on a napkin. He envisioned a family-owned and operated business, which stood on a foundation of quality and integrity. Although he never before imagined starting a coffee company, he felt led to follow this path, and chose to do so with courage and faith. People who visited us at the kiosk would often ask us if we were selling online, saying, "if you were on Amazon, I'd totally buy your coffee there!" Ding ding ding! We listened and we responded and the adventure continued! Even though word of mouth was beginning to bring us new customers outside of the Lancaster area, we realized that there was a need to acquire effective exposure on a national level. It didn't take long to figure out that Amazon was the answer! And now here we are with the answer! Receiving your coffee direct from Amazon to you provides the guaranteed best quality and experience, hands down! There's no need to chance buying old coffee that's been sitting on store shelves for who knows how long? It's the proverbial slam dunk! 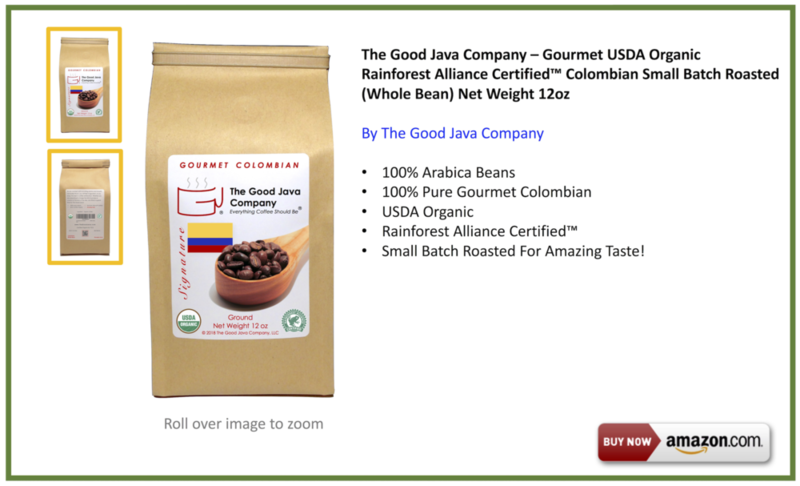 If you are one of the many coffee lovers that enjoys The Good Java, we would greatly appreciate your posting a positive review of our coffee on Amazon. Thank you for helping us grow our business!